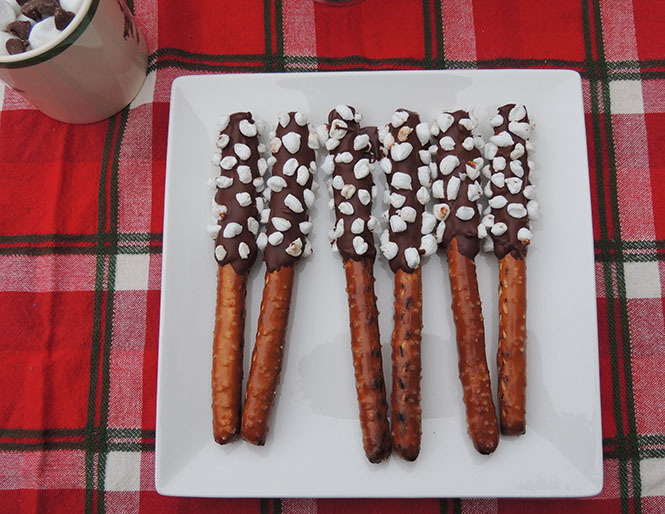 All you need to make these hot chocolate stirrers are pretzel rods, chocolate chips to melt and mini marshmallows. If you can find the super mini marshmallows (that aren't the hard ones that come with packs of hot chocolate - tried those and hated them!) then four for you, Glen Coco. 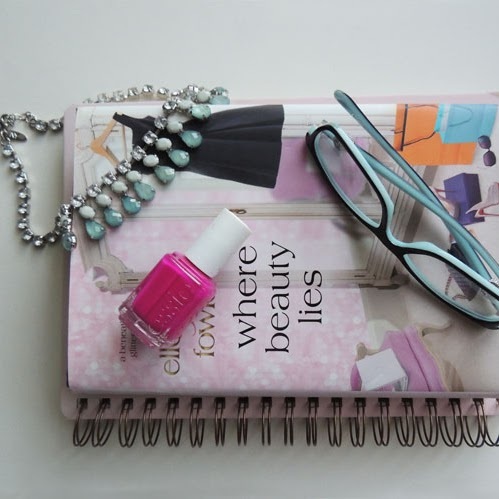 Because I couldn't find them anywhere! But the regular mini marshmallows worked just as well. I used a super sharp knife and cut each mini marshmallow into fours and then into eights and got these super-mini marshmallows. If you let them sit out for a few minutes after cutting them, they're easier to move around without getting your hands all sticky. Melt your chocolate of choice (I would imagine dark or white chocolate would be just as delicious!) 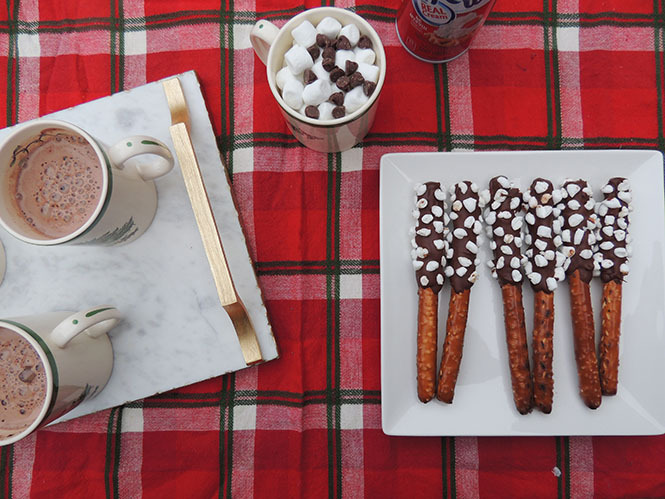 and dip each pretzel rod in the chocolate. I covered each pretzel a little less than half way with chocolate. 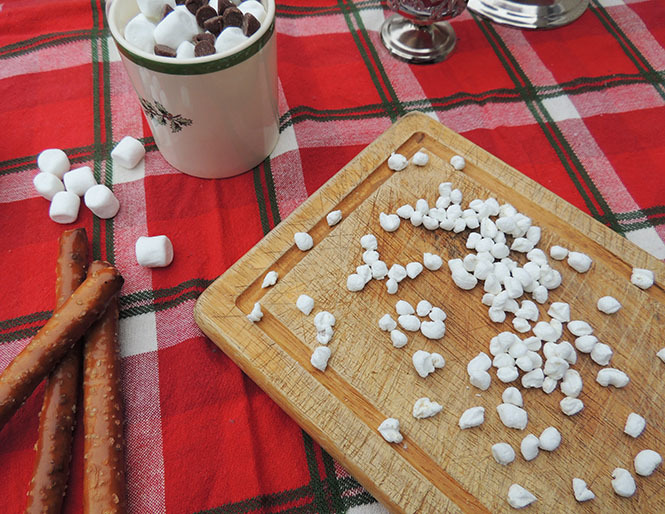 Then add the marshmallows on around the pretzel rod. I found that using a toothpick to pick each mini marshmallow up helped *so* much here! Place them on a piece of parchment paper and put them in the fridge for 20-30 minutes or until the chocolate has hardened. It doesn't take long, but the longer you leave them the better - because they won't melt as fast when you add them to the hot chocolate. Aren't they so cute?! 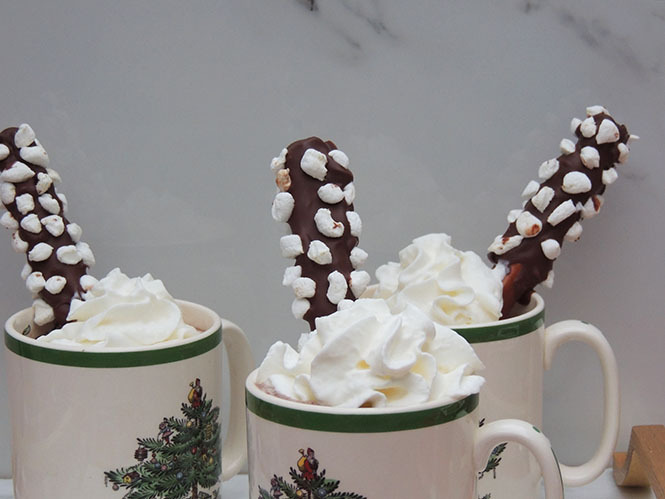 These are so ridiculously easy to make - and you can stir your hot chocolate with it and eat it. And I didn't spend $15 for a set of 4, so I'm happy. ;) You could put together an entire hot chocolate bar with these and it'd be perfect for a holiday party or even to have on the dessert table! 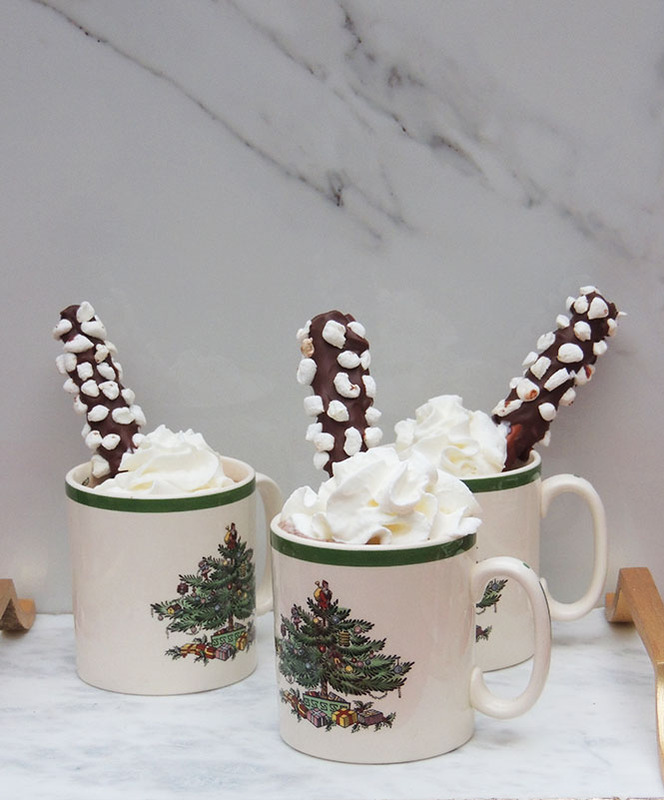 I always add whipped cream to my hot chocolate (just pack it on, it's the holidays it's fine ;) and these dipper sticks are so delicious with the whipped cream too! Making these took all of 15 minutes; 10 of which were spent cutting mini marshmallows, ha! They look so pretty and next time I make these I'm going to try putting pieces of crushed peppermint on the chocolate! They also make for a great party favor - you can wrap a bunch up in cellophane and give them to party guests! If you wanna get really fancy, get cute mugs and put these wrapped up in each mug! Are these not the cutest things?! I love them! I'm so excited to go make myself a cup of hot chocolate and have one of these today! 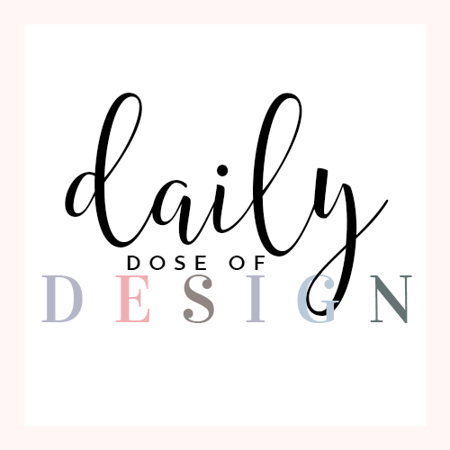 Let me know what you think if you try making them!! Wow! These are so stinkin' adorable. How perfect for Christmas! Such a cute idea! 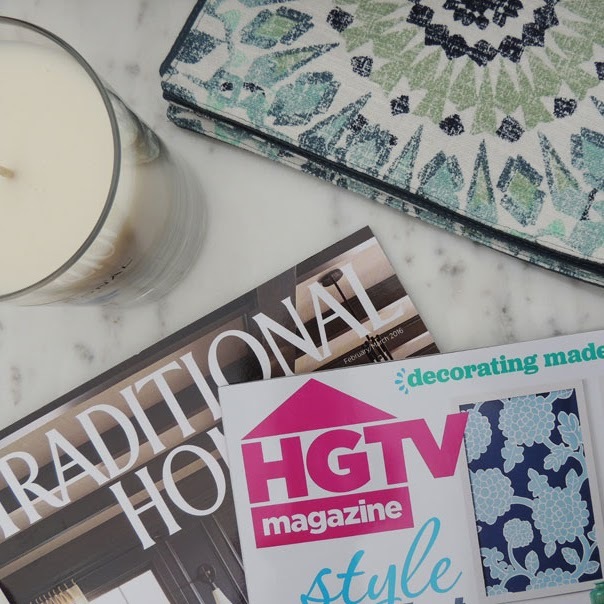 So perfect for holiday gatherings. yum! these are so cute and fun for the holiday! These are so cute, I'm going to make these with my little sister when I'm home! I love a good cup of hot cocoa this time of year. Funny how expensive some things can be! How creative! These would be so cute for a holiday party! Um this sounds delicious!!! I might have to try this during this winter season. Love these! 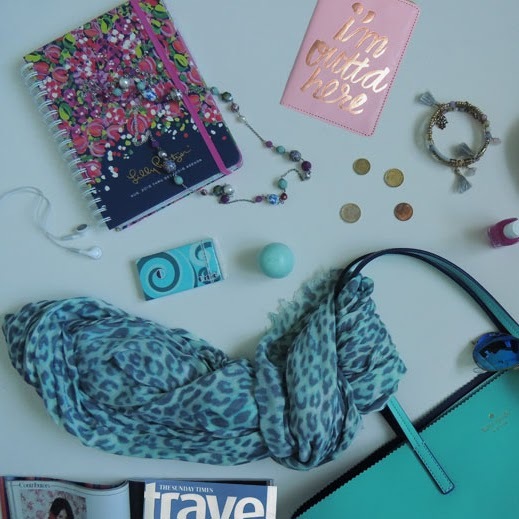 Definitely want to try making them with my girls, thanks for sharing! That looks amazing - sign me up for one of those! These stirrers are such a great idea and would be such a hit at parties. I am always looking for new ways to get my chocolate fix. Thank you for this one. These are amazing! I'll have to try these out with my sisters! I have been all about hot chocolate lately. 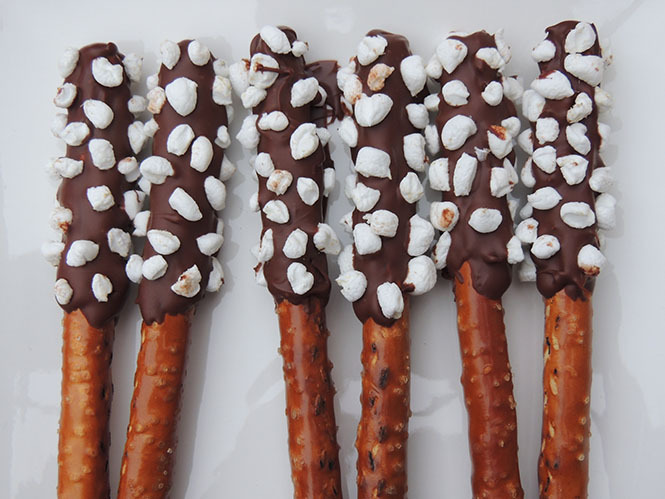 I've never thought about using chocolate covered pretzels as stirrers but they are so cute!! I love hot chocolate and cute little things you can add to the drink like these! Such a great idea. 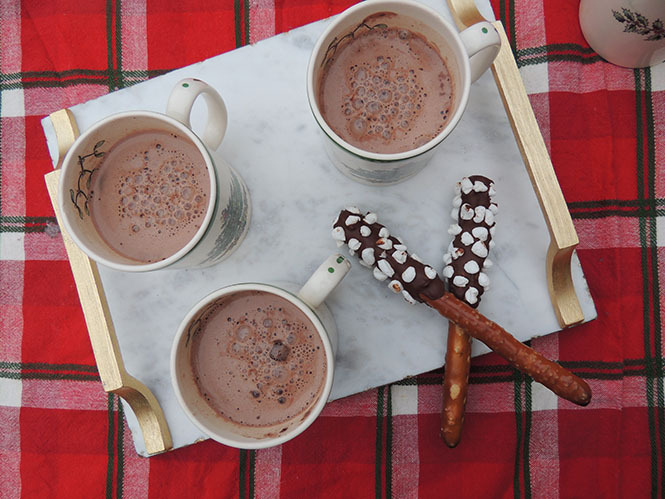 I love hot chocolate in the winter and adding the saltiness of the pretzel sounds divine. 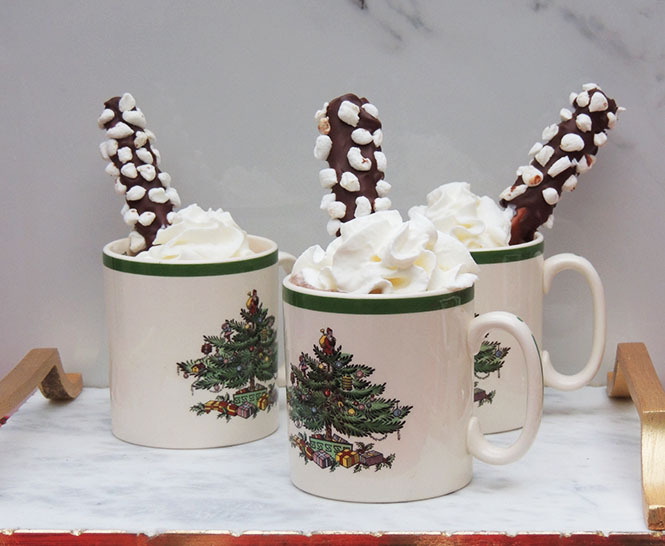 That's such a fun way to serve hot cocoa! I love how easy to make those stirrers are. They're going to be a hit with the guests! I'm drinking hot chocolate right now and wish I had these! Brilliant idea! Oh my goodness, this is the cutest idea!! Definitely saving this to make for my friends and co-workers next year! Hot chocolate is makes me alive every morning. This one is fantastic I would love to try it with stirrers. How yummy do those look! this is such a great idea!! These are so cute and look so delicious. Can't wait to try them! I NEVER would have thought to try these! What a creative way to serve hot cocoa. Looks delicious! I've made these before! they are so cute, easy, and delicious! These are way too cute! You're so creative. The hot chocolate is perfect for Christmas season, but with that stirrer, hot chocolate is more exciting! Thats too cute that it looks like its fake haha! I would love to try this on Christmas eve! Thanks for sharing this very nice idea! What a creative idea. My kids would love this! 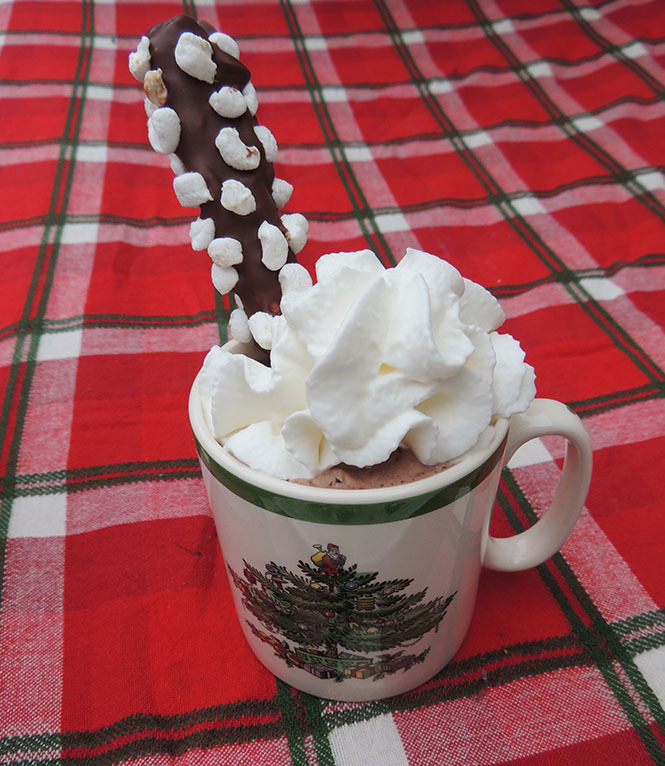 Now that's the way to stir your hot chocolate. Those look fanastic! 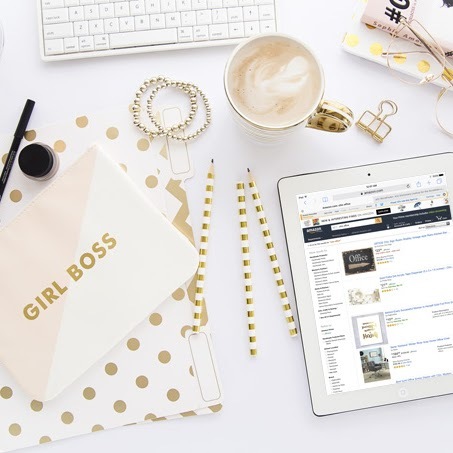 This DIY is brilliant! Not only is it much more affordable, but I'm sure these yummy pretzel sticks taste much better than something you would've gotten at a store! It was a great try with this superb recipe. My brother loved it alot. As he is a fitness freak and his basic routine usually includes the Xtreme no bodybuilding supplement. Now these chocolate stirrers are also the part of it. We all love to eat good and tasty food. But sometimes good food does recover your meals requires. For that you need to add hgh supplements in your daily meal. This recover your all requirements that some food can't do. Healthy food is food considered normally beneficial to human health a normal healthy diet required for human nutrition. 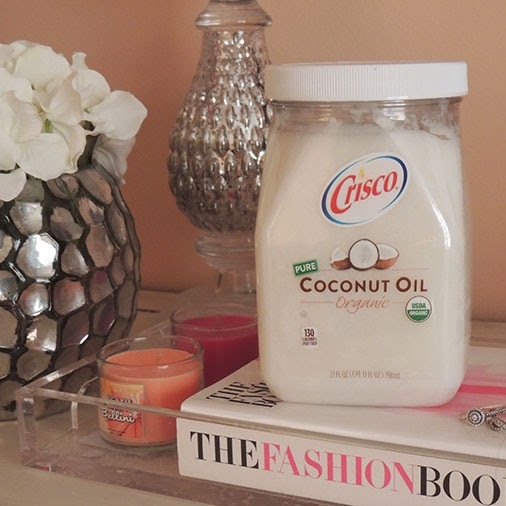 Thanks for sharing such an amazing recipe as it seems to be healthy and yummy. Surely gonna try this.